Dataset (GIS map) (2015) and associated products for the "Rainfall erosivity" (R-factor), one of the input layers when calculating the Universal Soil Loss Equation (USLE) model, which is the most frequently used model for soil erosion risk estimation; for EU28+Switzerland; R-factor map at resolutions of 500m. Description: This map provides a complete rainfall erosivity dataset for European Union (28 member States) and Switzerland based on REDES database with high temporal resolution rainfall measurements of 26,394 years. Gaussian Process Regression(GPR) model was used to interpolate the rainfall erosivity values of single stations and to generate the R-factor map. REDES is provided as a point database including R-factor for each of the 1,675 stations (see below). R-factor detailed assessments for Greece and Switzerland are available (see below). Future projections (2050) of R-factor are available (see below). The purpose of this study is to assess rainfall erosivity in Europe in the form of the RUSLE R-factor, based on the best available datasets in Europe. We used the Rainfall Erosivity Database on the European Scale(REDES) which contains 1,675 precipitation stations in all European Union(EU) Member States and Switzerland, with temporal resolutions of 5 to 60 minutes. The R-factor values calculated from precipitation data of different temporal resolutions were normalised to R-factor values with temporal resolutions of 30 minutes using linear regression functions. Precipitation time series ranged from a minimum of 5 years to maximum of 40 years. The average time series per precipitation station is around 17.1 years, the most datasets including the first decade of the 21st century. Gaussian Process Regression(GPR) has been used to interpolate the R-factor station values to a European rainfall erosivity map at 1 km resolution. The covariates used for the R-factor interpolation were climatic data (total precipitation, seasonal precipitation, precipitation of driest/wettest months, average temperature), elevation and latitude/longitude. The mean R-factor for the EU plus Switzerland is 722 MJ mm ha-1 h-1 yr-1, with the highest values (>1,000 MJ mm ha-1 h-1 yr-1) in the Mediterranean and alpine regions and the lowest (Less than 500 MJ mm ha-1 h-1 yr-1) in the Nordic countries. The erosivity density (erosivity normalised to annual precipitation amounts) was also highest in Mediterranean regions which implies high risk for erosive events and floods. 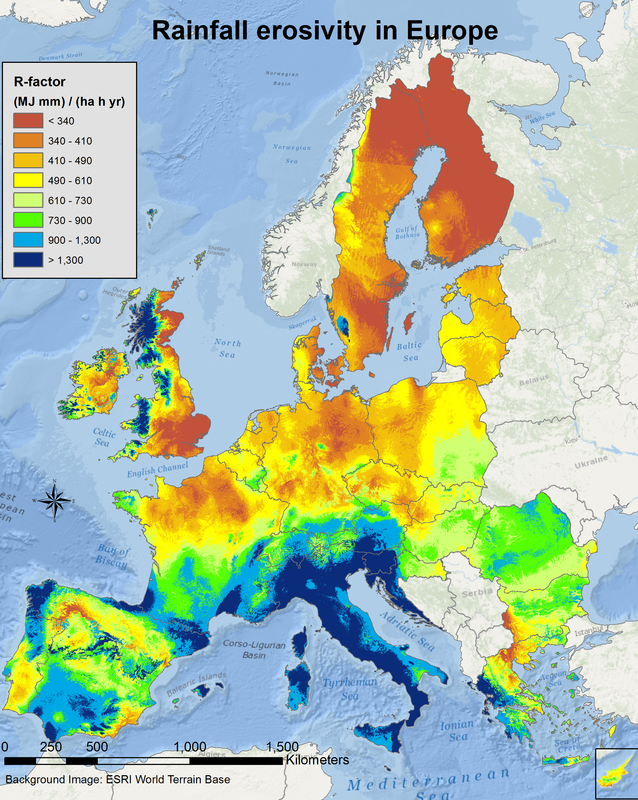 The Rainfall Erosivity Database on the European Scale (REDES) includes high temporal resolution precipitation data and the claculated R-factor from 1,675 precipitation stations within the European Union (EU) and Switzerland. The Rainfall Erosivity Database on European Scale (REDES) of precipitation stations is the result of calculating the R-factor for a total of 26,394 years with a mean value of 17.1 years per station. The data collection exercise of high temporal resolution data began in March 2013 and was concluded in May 2014. Data for additional 134 stations were collected in 2015. For the present rainfall erosivity data collection exercise, a participatory approach has been followed in order to collect data from all Member States (Aknowledgments). The precipitation data collected from the 28 countries across Europe have different temporal resolutions: 60-min, 30-min, 15-min, 10-min and 5-min. In order to homogenise the R-factor results calculated using different time-step data, conversion factors were established to have the data at the 30-min temporal resolution (reference). The rainfall erosivity in 2050 was modelled based on on a moderate climate change scenario (HadGEM RCP 4.5) and using as main data sources the REDES based European R-factors and as covariates the WorldClim climatic datasets. Although the rainfall erosivity projections are based on many uncertainties, this pan-European spatial estimation highlights the areas where rainfall erosivity is projected to undergo substantial changes. 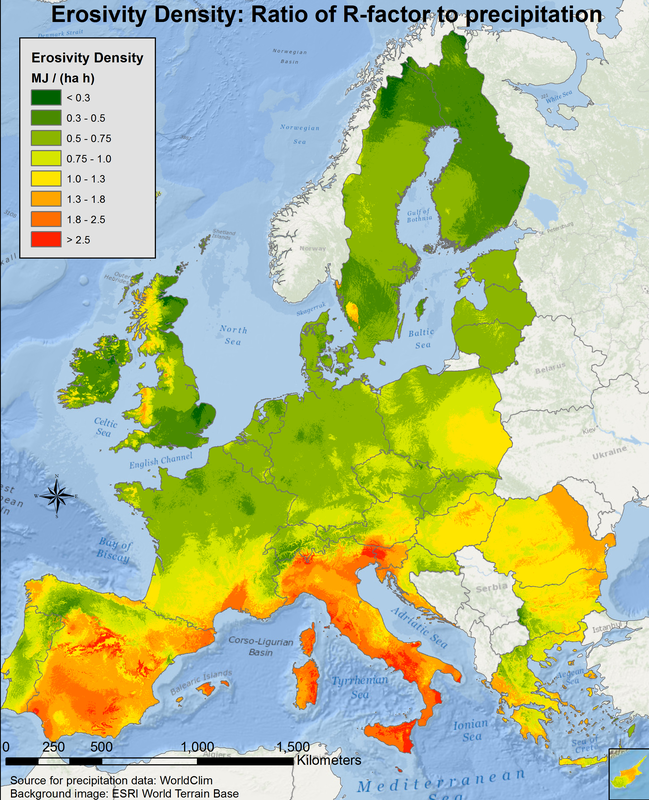 The predicted mean increase in R-factor is expected also to increase the threat of soil erosion in Europe. However, climate change might substantially affect land cover and land use, which might counterbalance or enhance some erosional trends. The most prominent increases of R-factors are predicted for North-Central Europe, the English Channel, The Netherlands and Northern France. On the contrary, parts of the Mediterranean basin show a decrease of rainfall erosivity. he mean rainfall erosivity for the European Union and Switzerland is projected to be 857 MJ mm ha-1 h-1yr-1 till 2050 showing a relative increase of 18% compared to baseline data (2010).The changes are heterogeneous in the European continent depending on the future projections of most erosive months (hot period: April–September). The output results report a pan-European projection of future rainfall erosivity taking into account the uncertainties of the climatic models. The development of Rainfall Erosivity Database at European Scale (REDES) and its 2015 update with the extension to monthly component allowed to develop monthly and seasonal R-factor maps and assess rainfall erosivity both spatially and temporally. During winter months, significant rainfall erosivity is present only in part of the Mediterranean countries. A sudden increase of erosivity occurs in major part of European Union (except Mediterranean basin, western part of Britain and Ireland) in May and the highest values are registered during summer months. Starting from September, R-factor has a decreasing trend. The mean rainfall erosivity in summer is almost 4 times higher (315 MJ mm ha-1 h-1) compared to winter (87 MJ mm ha-1 h-1). The monthly prediction is an order more difficult than the annual one as it is limited by the number of covariates and, for consistency, the sumof all months has to be close to annual erosivity. The performance of the Cubist models proved to be generally high, resulting in R2 values between 0.40 and 0.64 in cross-validation. The maps also show a clear delineation of areas with different erosivity seasonal patterns, whose spatial outline was evidenced by cluster analysis. The monthly erosivity maps can be used to develop composite indicators that map both intra-annual variability and concentration of erosive events. Consequently, spatio-temporal mapping of rainfall erosivity permits to identify the months and the areaswith highest risk of soil losswhere conservationmeasures should be applied in different seasons of the year. j) The Rainfall Erosivity Database at European Scale (REDES) 1,675 stations with R-factor data. To get access to the all datasets and the code, please compile the request form; instructions will then follow how to download the datasets. More information about Rainfall erosivity in the corresponding section. Panagos, P., Ballabio, C., Borrelli, P., Meusburger, K., Klik, A., Rousseva, S., Tadic, M.P., Michaelides, S., Hrabalíková, M., Olsen, P., Aalto, J., Lakatos, M., Rymszewicz, A., Dumitrescu, A., Begueria, S., Alewell, C. 2015. 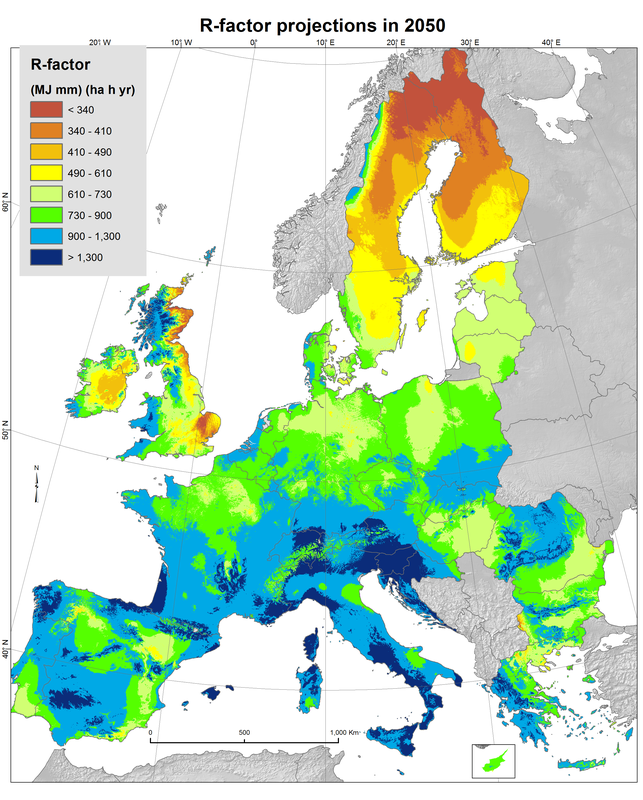 Rainfall erosivity in Europe. Sci Total Environ. 511: 801-814. DOI: 10.1016/j.scitotenv.2015.01.008 . Panagos, P., Ballabio, C., Meusburger, K., Spinoni, J., Alewell, C., Borrelli, P. 2017. Towards estimates of future rainfall erosivity in Europe based on REDES and WorldClim datasets. Journal of Hydrology, 548: 251-262. Panagos, P., Borrelli, P., Spinoni, J., Ballabio, C., Meusburger, K., Beguería, S., Klik, A., Michaelides, S., Petan, S., Hrabalíková, M., Olsen, P., Aalto, J., Lakatos, M., Rymszewicz, A., Dumitrescu, A., Tadic, M.P., Diodato, N., Kostalova, J., Rousseva, S., Banasik, K. Alewell, C. 2016. Monthly rainfall erosivity: conversion factors for different time resolutions and regional assessments. Water, 8(4), No 119. Panagos, P., Meusburger K., Ballabio C., Borrelli P., Begueria S., Klik A., Rymszewicz A., Michaelides, S, Olsen, P., Tadic, M.P., P., Aalto, J., Lakatos, M., Dumitrescu, Rousseva, S., Montanarella, L., Alewell C. 2015. Reply to the comment on "Rainfall erosivity in Europe" by Auerswald et al. Science of the Total Environment, 532, pp. 853-857. Download the Article:10.1016/j.scitotenv.2015.05.020. By sending these data, you declare that you have read & accept the notification below and that your personal data will be handled by the JRC only for statistical purposes (conformed with privacy statement). The data provided has been prepared for use by internal research activities in the Joint Research Centre (JRC) Ispra. The data have been produced in 2013-2017 in collaboation between European Commission (Joint Research Centre), Institute of Environmental Geosciences, University of Basel and a number of European Meteorological and Environmental Institutions. The data are the result of JRC research activities and are primarily made available for further research. The JRC does not accept any liability whatsoever for any error, missing data or omission in the data, or for any loss or damage arising from its use. The JRC agrees to provide the data free of charge but is not bound to justify the content and values contained in the databases. The permission to use the data specified above is granted on condition that, under NO CIRCUMSTANCES are these data passed to third parties. They can be used for any purpose, including commercial gain. b) Participate in the verification of the data (e.g. by noting and reporting any errors or omissions discovered to the JRC). Panagos, P., Ballabio, C., Borrelli, P., Meusburger, K. 2016. 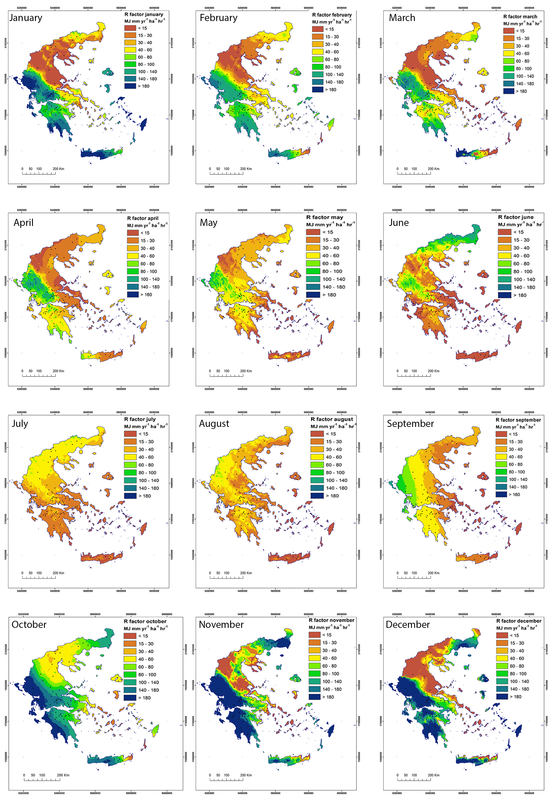 Spatio-temporal analysis of rainfall erosivity and erosivity density in Greece. Catena, 137, 2603, pp. 161-172. Panagos, P., Meusburger K., Ballabio C., Borrelli P., Begueria S., Klik A., Rymszewicz A., Michaelides, S, Olsen, P., Tadic, M.P., P., Aalto, J., Lakatos, M., Dumitrescu, Rousseva, S., Montanarella, L., Alewell C. 2015. Reply to the comment on "Rainfall erosivity in Europe" by Auerswald et al. 2015. Science of the Total Environment, 532: 853-857. Meusburger, K., Steel, A., Panagos, P., Montanarella, L., Alewell, C. Spatial and temporal variability of rainfall erosivity factor for Switzerland. Hydrology and Earth System Sciences, 16, 167-177, 2012.